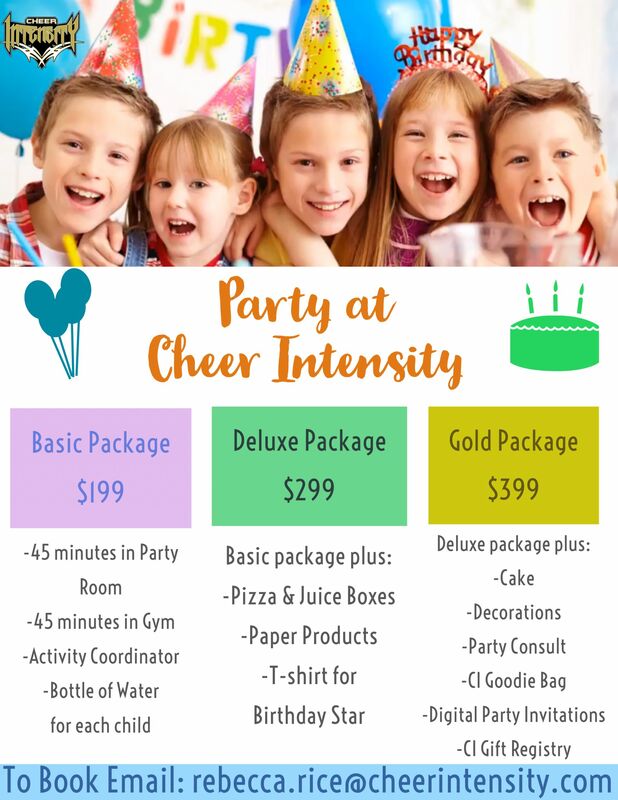 Beginning in January, you can now have your BIRTHDAY PARTY at Cheer Intensity! Our new location in Colonie, NY will feature a state of the art party room with access to our awesome training facility! We are currently offering 3 Party Packages with a handful of Party Enhancements available! Each party is priced for 12 children (including the Birthday Star) and additional children can be added for a charge. A $100 non-refundable deposit will be required to hold your party date. Payment of balance and final headcount is due 1 week prior to party date. If you have any questions or want to move forward with the booking process please email rebecca.rice@cheerintensity.com With the start of CI Party Season we expect to book up quick so don't miss out on your chance to be one of the first families to celebrate their birthday at Cheer Intensity! Birthday Parties at CI are open to the general public!